As a Respiratory Therapist, it will be crucial for you to know and understand all aspects of treating patients who are on the mechanical ventilator. And one of the most important aspects of this is know about all the drugs for mechanical ventilation. Not to mention, you must know this information in Respiratory Therapy school and for the board exams as well. 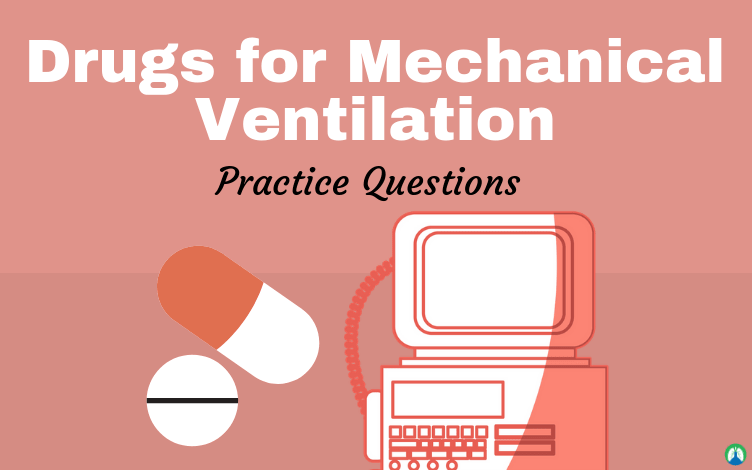 So to help with that, we put together this study guide that is loaded with practice questions that can help you learn everything you need to know about the drugs for mechanical ventilation. Are you ready to get started? 1. What are the 3 types of drugs needed during ventilation? Neuromuscular blockers, Sedatives, and Analgesics. 2. What are some examples of Neuromuscular blocking agents? Succinylcholine chloride, Vecuronium, Pavulon, Rocuronium, Atracurium, and Cisatracurium. 3. What is the action of Succinylcholine chloride? It is an ultrashort-acting depolarizing agent. 4. What are some examples of drugs used for sedation and analgesia? Lorazepam (Ativan), Midazolam (Versed), Morphine, Dilaudid, Fentanyl, and Propofol. 5. What are Metaproterenol (Alupent) and Albuterol (Ventolin)? They are short-acting bronchodilators used to reverse acute bronchospasm and are given in 15-30 minute intervals until effective. You may give them with oxygen to increase tissue perfusion. 6. What is Methylprednisone (Solu-medrol)? It is a corticosteroid used along with bronchodilators to decrease inflammation, acute respiratory failure. It requires 4-5 days of use before it is effective. 7. What is Dexmedetomidine (Precedex)? It is a sedative, amnesic, and analgesic. It is indicated for short-term sedation of a patient needing mechanical ventilation. The patient can be easily aroused and then return to a sleep-like state. Side effects include nausea, bradycardia, and hypotension. They are used to decrease pain in patients with acute respiratory failure that are on the mechanical ventilator. They are given with sedation and paralytics. It is an ester that plays a role in the transmission of nerve impulses at synapses and neuromuscular junctions. It is metabolized by the enzyme cholinesterase. Too much or too little of acetylcholine at the motor endplates may lead to muscle blockade. It is used for preventing nausea and vomiting. It is used for diminishing anxiety. A group of drugs that depresses the central nervous system. They have many adverse effects, including alteration of the respiratory rate, heart rate, blood pressure, and temperature. They are used in seizure disorders and intracranial pressure imbalances. A group of drugs with strong hypnotic and sedative actions. They are used mainly to reduce anxiety and induce sleep. 14. What are Cathartic agents? Active purgatives used to produce bowel movements. 15. What does Chronotropic affect? Hormones that are released from the cortex of the adrenal gland. Their potent anti-inflammatory effects make corticosteroids in the treatment of asthma and chronic bronchitis. They are available for intravenous administration as well as inhalation. 17. What are some examples of inhaled steroids? Dexamethasone (Decadron, Respihaler), beclamerhasone (Beclovent, Vanceril), flunisolide (Aerobid), and tricimcinolone (Azmacort). 18. What are Depolarizing agents? Drugs that prolong the depolarization phase of muscle contraction, thus rendering the repolarization/depolarization sequence (normal mechanism for muscle movement) impossible and causing muscle blockade. An example is succinylcholine (Anectine, Quelicin). 19. What is Dexmedetomidine (Precedex)? An intravenous drug that offers anxiolysis and analgesia but respiratory depression. 20. What is Gamma-aminobutyric acid (GABA)? A major central nervous system inhibitory transmitter that regulates the chloride ion channel and hyperpolarizes the neurons. Once the neurons are hyperpolarized and become resistant to repeated depolarization, sedation results. 21. What is Haloperidol (Haldol)? A drug for the control of delirium in mechanically ventilated patients. 22. What does inotropic affect? 23. What is Nitric oxide? Inhaled nitric oxide or (iNO)therapy has been used to treat persistent pulmonary hypertension and hypoxemic respiratory failure of the newborn, respiratory distress syndrome and hypoxemic respiratory failure of older infants and children, and acute respiratory distress in adults. 24. What are nondepolarizing agents? Drugs that compete with acetylcholine for the receptor sites at the motor endplates, thus blocking the normal action of acetylcholine and causing muscle blockade. 25. What are some examples of nondepolarizing agents? Vecuronium bromide (Norcuron) and pancuronium bromide (Pavulon). 26. What are Opioid analgesics? Drugs that are used to control pain via the central nervous system. Examples are morphine, codeine, meperidine (Demerol, a synthetic compound). 27. What are Parasympatholytic bronchodilators? Anticholinergic bronchodilators. Drugs that dilate the airways by inhibiting the parasympathetic branch of the autonomic nervous system. Examples are atropine and ipratropium bromide. 28. What is Propofol (Diprivan)? An intravenous drug that provides a spectrum of CNS effects ranging from light sedation to deep anesthesia. 29. What is the Ramsay Scale? The scoring system with a scale ranging from level I to VI; used to assess the degree of sedation. 30. What is the generic name of Xanax and what type of drug is it? Alprazolam, and it is a sedative. 31. What is the generic name of Valium and what type of drug is it? Diazepam, and it is a sedative. 32. What is the generic name of Versed and what type of drug is it? Midazolam, and it is a sedative. 33, What is the generic name of Ativan and what type of drug is it? Lorazepam, and it is a sedative. 34. What is a common brand name of Alprazolam and what type of drug is it? Xanax, and it is a sedative. 35. What is a common brand name of Diazepam and what type of drug is it? Valium, and it is a sedative. 36. What is a common brand name of Midazolam and what type of drug is it? Versed, and it is a sedative. 37. What is a common brand name of Lorazepam and what type of drug is it? Ativan, and it is a sedative. 38. What are the 4 most common Sedative drugs? Alprazolam (Xanax), Diazepam (Valium), Midazolam (Versed), and Lorazepam (Ativan). 39. What do sedative drugs do? They help to decrease anxiety and promote relaxation. 40. What are 3 common Anesthetic drugs? Propofol (Diprivan), Ketamine (Ketalar), and Etomidate (Amidate). 41. What do anesthetic drugs do? They decrease the patient’s ability to perceive sensation and can render patient unconsciousness. 42. What is the generic name for Diprivan and what type of drug is it? Propofol, and it is an anesthetic. 43. What is the generic name for Ketalar and what type of drug is it? Ketamine, and it is an anesthetic. 44. What is a generic name for Amidate and what type of drug is it? Etomidate, and it is an anesthetic. 45. What is a brand name for Propofol and what type of drug is it? Diprivan, and it is an anesthetic. 46. What is a brand name for Ketamine and what type of drug is it? Ketalar, and it is an anesthetic. 47. What is a brand name for Etomidate and what type of drug is it? Amadate, and it is an anesthetic. 48. What are the most common Analgesics? Morphine, Codeine, Meperidine (Demerol), Fentalyn, Hydromorphone (Dilaudid), Oxycodone (Oxycontin), and Hydrocodone. 49. What is the generic name for Demerol, and what type of drug is it? Meperidine, and it is an analgesic. 50. What is the generic name for Sublimaze and what type of drug is it? Fentalyn, and it is an analgesic. 51. What is the generic name for Dilaudid and what type of drug is it? Hydromorphone, and it is an analgesic. 52. What is the generic name for Oxycontin and what type of drug is it? Oxycodone, and it is an analgesic. 53. What is a brand name for Meperidine and what type of drug is it? Demerol, and it is an analgesic. 54. What is a brand name for Fentalyn and what type of drug is it? Sublimaze, and it is an analgesic. 55. What is a brand name for Hydromorphone and what type of drug is it? Dilaudid, and it is an analgesic. 56. What is a brand name for Oxycodone and what type of drug is it? Oxycontin, and it is an analgesic. 57. What do Analgesic drugs do? They help to decrease the sensation of pain without the loss of consciousness. 58. What are the most common Neuromuscular Blocking Agents? Pancuronium (Pavulon), Vecuronium (Norcuron), Rocuronium (Zemuron), Cisatracurium (Nimbex), Atracurium (Tracrium), and Succinylcholine (Anectine). 59. What is a generic name of Pavulon and what type of drug is it? Pancuronium, and it is a neuromuscular blocking agent. 60. What is a generic name of Norcuron and what type of drug is it? Vecuronium, and it is a neuromuscular blocking agent. 61. What is a generic name of Zemuron and what type of drug is it? Rocuronium, and it is a neuromuscular blocking agent. 62. What is a generic name of Nimbex and what type of drug is it? Cisatracurium, and it is a neuromuscular blocking agent. 63. What is a generic name of Tracrium and what type of drug is it? Atracurium, and it is a neuromuscular blocking agent. 64. What is a brand name of Pancuronium and what type of drug is it? Pavulon, and it is a neuromuscular blocking agent. 65. What is a brand name of Vecuronium and what type of drug is it? Norcuron, and it is a neuromuscular blocking agent. 66. What is a brand name of Rocuronium and what type of drug is it? Zemuron, and it is a neuromuscular blocking agent. 67. What is a brand name of Cisatracurium and what type of drug is it? Nimbex , and it is a neuromuscular blocking agent. 68. What is a brand name of Atracurium and what type of drug is it? Tracrium, and it is a neuromuscular blocking agent. 69. What do neuromuscular blocking agents do? The cause skeletal muscle relaxation and paralysis. 70. Why do we give sedatives, anesthetics, analgesics, and neuromuscular blocking agents to mechanicaly ventilated patients? They help to achieve patient-ventilator synchrony. 71. What is the most commonly administered anesthetic induction agent that is dissolved in a lipid emulsion for intravenous delivery? 72. When giving a patient a Neuromuscular Blocking Agent, what two other types of drugs need to be given? 73. What is another common classification name for sedatives? 74. What is the most common use of Succinylcholine? It is used for an endotracheal intubation procedure. 75. You are having difficulty intubating a combative patient in the emergency department. The respiratory therapist should recommend the delivery of which drug to facilitate intubation? Succinylcholine, which is a fast-acting short-lasting paralytic agent. 76. The physician is preparing to perform a bronchoscopy on a patient with suspected lung cancer. The physician wants to accomplish conscious sedation for the procedure. The respiratory therapist should recommend which medication? 77. Which of the common Neuromuscular Blocking Agents is a “depolarizing agent”? 78. What can be given to reverse the paralyzing effects of non-depolarizing agents? Edrophonium (Tensolin) and Neostigmine (Prostigmin). 79. What is a common side effect of narcotic analgesic agents? 80. What are the types of drugs used with mechanical ventilation? 81. What are the uses of sedatives? To decrease anxiety, decrease agitation, minimize sleep deprivation, and minimize patient-ventilator dyssynchrony in non-conventional modes of ventilation. 82. What are the side effects of Benzodiazepine tranquilizers? 83. Narcotic opiate analgesics are used primarily for what? They are used primarily for pain relief. The secondary use is for sedation/anxiety. 84. What are the adverse reactions of narcotic opiate analgesics? Nausea and vomiting, respiratory depression, bradycardia, hypotension, muscle twitching/convulsions, histamine release, immune suppression, and addiction. 85. What can be given for the immediate reversal of narcotic agents? 86. What are the four levels of sedation? Minimal, moderate, deep, and anesthesia. 87. What are the indications for paralytic agents? Patient-ventilator dyssynchrony, non-conventional ventilation, to facilitate intubation, dynamic hyperinflation, ICP management, and to reduce O2 consumption & CO2 production. 88. What are depolarizing drugs? Drugs that prolong the depolarizing phase and block the usual repolarization/depolarization sequence from happening. These agents bind with the receptor sites. 89. What is an example of a depolarizing drug? 90. What are non-depolarizing drugs? Drugs that compete with acetylcholine from the receptor sites and block the normal action of acetylcholine. They are competitive agents. 91. What are some examples of non-depolarizing drugs? Vecuronium, Norcuron, Pancuronium, and Pavulon. 92. What agents are used for sedation and the maintenance of anesthesia? 93. What agent is used for delirium? 94. What agent is used for sedation of mechanically ventilated patients? Dexmedetomidine. Precedex has no respiratory depression and offers only analgesia and anxiolysis. 95. What agent is used for the dilation of pulmonary vessels? 96. What is iNO therapy used for? iNO therapy is used for pulmonary hypertension and hypoxemic respiratory failure for newborns. It helps with respiratory distress syndrome and hypoxemic respiratory failure of older infants and children. It is also used to treat ARDS in adults. 97. What is a depolarizing agent that is metabolized by plasma cholinesterase? 98. What is the most immediate and life-threatening adverse effect associated with both depolarizing and non-depolarizing agents? 99. Which of the following are given to patients to reduce anxiety, provide amnesia and improve tolerance to mechanical ventilation? 100. What is the most lipophilic benzodiazepine? 101. Special care must be exercised with the use of what in a patient being treated for severe pain? Naloxone (Narcan). It may reverse an untoward effect such as respiratory depression while causing the return of pain. 102. Which of the following barbiturates has a long-acting duration of action and a hypnotic effect of four to twelve hours? 103. What is an agent used in mechanical ventilation for sedation and maintenance of anesthesia? So there you have it. That wraps up our study guide on the drugs for mechanical ventilation. 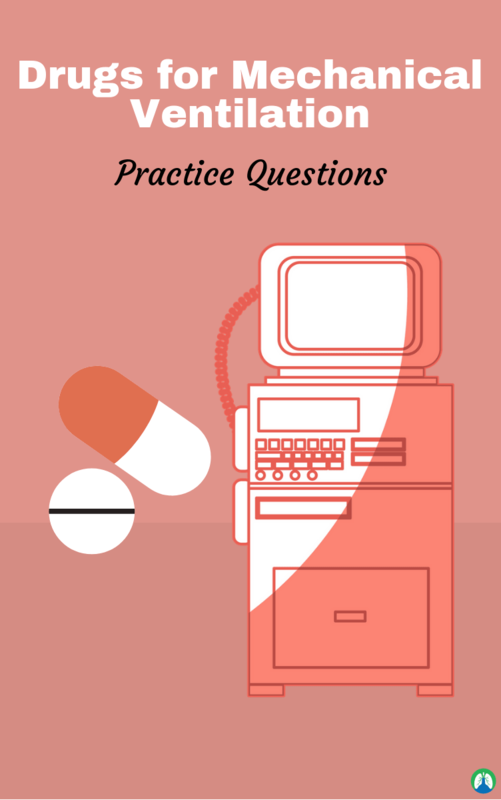 I hope that these practice questions were helpful for you and if you go through them a few times, you will easily developing a good understanding of this information. Thank you so much for reading and as always, breathe easy my friend.